The Studio Designs Craft Center provides a comfortable place to work, complete with matching stool, and keeps your art supplies easily in reach. The 31½"W × 23½"D work surface is made of maple laminate and tilts to 30°. 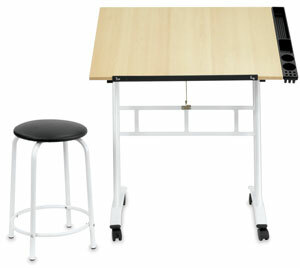 It's equipped with two removable side trays and a 24" pencil ledge. The powder-coated White steel frame sits on casters for mobility. The table measures 29½"H × 34"W × 23½"D overall, and the top reaches 37½"H at full tilt. The sturdy matching stool has a 14"Dia seat and stands 19½"H.